Braselton, Ga. (Oct. 3, 2015) – Christian Fittipaldi and Joao Barbosa – with an assist by IndyCar star Sebastien Bourdais – overcame treacherous weather conditions on Saturday at Road Atlanta, using a Prototype (P) class victory in the rain-shortened 18th edition of the Petit Le Mans powered by Mazda to clinch their second consecutive TUDOR United SportsCar Championship. Bourdais drove Action Express Racing’s No. 5 Mustang Sampling Corvette DP to the lead at the three-hour, 38-minute mark of the scheduled 10-hour race. He led the following 54 laps until a red flag stopped the action at the five-hour, 21-minute mark. Barbosa took over shortly after racing resumed with three hours, 33 minutes remaining and regained the class lead in the closing minutes, but with conditions continuing to deteriorate, the race was checkered at the seven-hour, 51-minute mark. I can’t say how happy we are with two championships in a row. 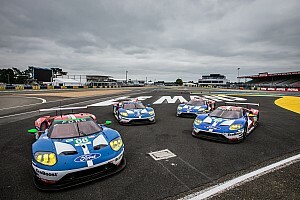 Assisted by the challenging conditions, several GT Le Mans (GTLM) competitors kept pace with their Prototype counterparts. Nick Tandy and Patrick Pilet won overall in the No. 911 Porsche North America Porsche 911 RSR, followed by John Edwards, Lucas Luhr and Jens Klingmann in the No. 24 BMW Team RLL BMW Z4 GTLM. Barbosa took third overall in the combined results. Fittipaldi and Barbosa entered the event tied for second with Action Express teammates Eric Curran and Dane Cameron, six points behind VisitFlorida.com Racing’s Richard Westbrook and Michael Valiante, 279-273. After Westbrook dominated the opening two hours of the race, a pair of spins on successive restarts by co-drivers Michael Valiante and Mike Rockenfeller cost the No. 90 VisitFlorida.com Corvette DP two laps, resulting in a fifth-place finish. Curran led 30 laps down the stretch, pitting and turning the No. 31 Whelen Engineering/Team Fox Corvette DP over to Dane Cameron shortly after the 11th caution of the race waved due to a spin by Prototype Challenge (PC) driver Bruno Junqueira. That gave the lead to Barbosa, who led six laps under the caution before race officials made the decision to wave the checkered flag. As a result, Fittipaldi and Barbosa unofficially came out on top in the final standings with 309 points, followed by Westbrook and Valiante with 306, and Curran and Cameron with 304. 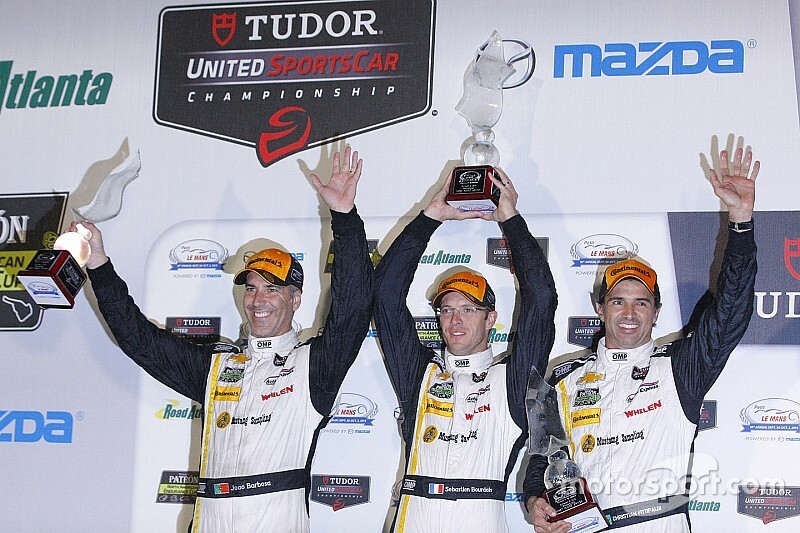 Scott Pruett, Joey Hand and Scott Dixon finished second in the No. 01 Ford EcoBoost/Riley DP, placing fourth in the championship. They were followed by Curran, Cameron and Max Papis in the No. 31 Whelen Engineering Corvette DP, while defending Petit Le Mans winners Ricky and Jordan Taylor with Max Angelelli finished fourth in the No. 10 Konica Minolta Corvette DP. It was the second victory of the season for the Action Express trio, who won the Mobil 1 Twelve Hours of Sebring Fueled by Fresh From Florida. 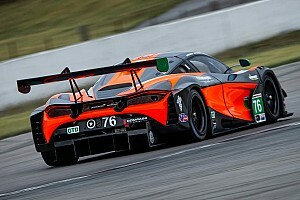 Fittipaldi and Barbosa won three races and the Tequila Patrón North American Endurance Cup in 2014, clinching the two titles with a second-place finish at Petit Le Mans powered by Mazda. Saturday, Action Express again doubled up, clinching TUDOR Championship and Patrón Endurance Cup crowns with a victory in the Road Atlanta classic. Tom Kimber-Smith, Mike Guasch and Andrew Palmer each took turns in the lead, driving the No. 52 PR1/Mathiasen Motorsports Cuttwood/Spyder ORECA FLM09 to a dominant victory in the Prototype Challenge (PC) class. The trio led 159 of the 190 laps en route to their fourth triumph of the season. While the trio wrapped up PC honors in the Patrón Endurance Cup, they came up five points shy of winning the season championship. Jon Bennett needed to achieve the minimum driving time to give CORE autosport its second consecutive PC crown. Bennett met that goal, and then joined Colin Braun in finishing fourth in the No. 54 Flex-Box/Composite Resources ORECA FLM09 to share the title. They were joined by Anthony Lazzaro at the finale. 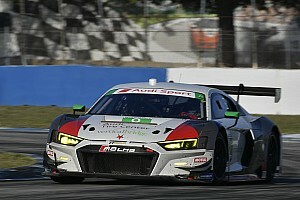 Renger van der Zande, Mike Hedlund, Mirco Schultis and Alex Popow finished second in the No. 8 Starworks Motorsport Martini ORECA FLM09. Johnny Mowlem led 16 laps early in the event and joined Marc Drumwright, Tomy Drissi and Don Yount in finishing third in BAR 1 Motorsports’ second-place No. 16 Southwest Reality Advisors/The Walk/Top 1 Oil entry. • Counting three consecutive titles in the American Le Mans Series presented by Tequila Patrón, CORE autosport has now won five straight PC team championships. 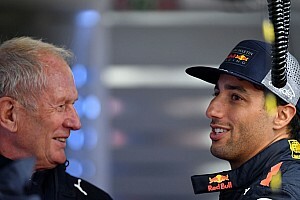 · In addition to finishing second in PC in the No. 8 Starworks Motorsport Martini ORECA FLM09, Alex Popow also led five laps in the team’s No. 88 entry. That car was involved in an incident while running second with John Falb at the wheel, resulting in that car’s retirement. • Ozz Negri and John Pew managed 100 laps in the No. 60 Michael Shank Racing AERO Honda/Ligier JS P2. 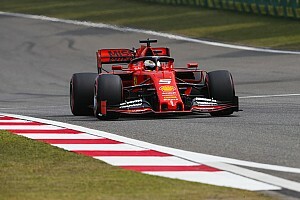 That was a feat in itself, considering that the car sustained major damage during an incident in Thursday’s night practice after Negri set the fastest lap of the weekend earlier in the day. The damaged car was taken to Elan Motorsports in nearby Braselton, where Elan and DeltaWing Racing worked all night making repairs, returning it to the track at 9 a.m. on Friday. • The 2015 champions will be recognized at the TUDOR Night of Champions on Monday evening at the Georgia Aquarium in downtown Atlanta. The next activity for the IMSA WeatherTech SportsCar Championship will be a two-day test at Daytona International Speedway, Nov. 17-18.